An El Nino event may be on its way this year, according to the US government's climate prediction centre. The agency says it has detected changes in sea temperatures in the Pacific Ocean, which occur before El Nino. However, other climatologists caution that it is too early to make a firm judgement as the Pacific has been highly variable this year. Seven years ago, the event caused billions of dollars of economic damage globally, with ruined crops and floods. El Nino usually occurs about once every seven years. The last major event was in 1997 and 1998, so in the words of a prominent UK climatologist, "we're due for one." Based on observations in the Pacific Ocean, the US climate prediction centre says there is a 50% chance that it is coming this year. Some other scientists agree with the US analysis but others say it is too early to tell. Certainly, it is unusual for El Nino to begin this late in the year. Habitually, the first signs are detected in April or May and climatologists say the Pacific has been highly variable this year, making firm prediction difficult. Each El Nino begins with an unusual warming pattern in the waters of the Pacific Ocean, but later affects weather around the tropics. 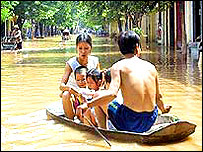 The 1997-98 event caused billions of dollars of economic damage globally with crops ruined in parts of Africa and Asia, floods on the west coast of the Americas, and lost fish catches. Already, Agricultural experts in east Asia and Australia are warning of significant crop losses if another El Nino does arrive. However, not all the effects are negative. A US hurricane forecasting centre has revised its projected number of hurricanes and tropical storms downwards in the light of the El Nino prediction.